Portrait of Sam Adams by John Singleton Copley. 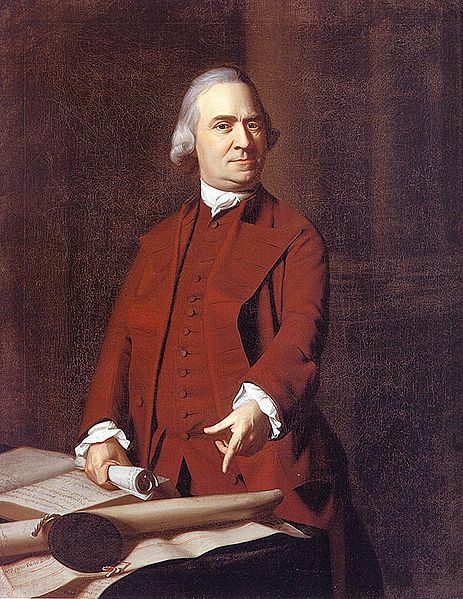 Samuel Adams was a patriot leader during the American Revolution era, born in Boston. He became a tax collector in 1756 and was elected to the Massachusetts House of Representatives in 1765. Adams was one of the Founding Fathers, and led the push for liberty through propaganda and his involvement in the Sons of Liberty with John Hancock. Adams was a second cousin to John Adams, the second President and fellow Founder. He also signed the Declaration of Independence. Throughout his career, Adams adhered to an ascetic ideal of virtue that reflected both his Puritan heritage and his republican principles. He mobilized popular opinion against Britain through his mastery of propaganda techniques and his use of the press. Equally important was his participation in political organizations such as the Sons of Liberty. Adams was especially active in securing passage of the 1768 Massachusetts Circular Letter, which denounced the Townshend Acs (1767). IN 1772, he established the Boston Committee of Correspondence, which served as a model for other colonies. Adams presided over the mass meeting that preceded the Boston Tea Party in 1773. He has been credited with giving the signal that instigated the tea’s destruction, although his exact role in this event is unclear. In 1774, Adams was elected to the Continental Congress, and he continued to be involved in revolutionary politics. This fervor for freedom coexisted with a firm belief in social order, even after the Revolution. As a result, he supported the Shay’s Rebellion in 1786.